I am a lucky man these days. Rather than dealing with a 30 + mile commute like most of my fellow countryman, my trip to work is about 20 feet down the hall on most days. This offers me many benefits; fuel and toll cost savings, lack of commute anxiety, comfy clothing…the list goes on. But the greatest of these advantages has to be my ability to watch all the talking heads on morning TV trying to feed you your opinions before most have had the chance to really wake up. I get to lie in bed with my coffee watching them endlessly pump propaganda (like I’m one to talk) with claims of the outrageous and emotional. I can do this for hours. Just lie there with my 20 oz of Wawa regular and flip between the heartfelt stories on Today, to the lighthearted yet serious discussions on Morning Joe, to the apocalyptic investment analyses on Squawk Box, then on to the next news picture show. Anyone who knows me will tell you I am not a morning person. It’s a running joke with family, friends from all different stages of my life, and co workers, but the hilarity of morning TV news has turned me into an early riser. I sometimes take for granted that this gibberish isn’t confined to the morning hours because that’s usually the only time that I subject myself to this never ending nonsense, but I let myself go a bit today. Today I stayed in bed until about 9:15 watching my morning entertainment (don’t worry about my employer, it’s rare that I ever finish work by 5-one of the hazards of a home work life). This gave me the opportunity to see how the absurdity really starts to kick up as the day begins. Today I had the pleasure of watching some junk on MSNBC hosted by the perennial joker, Chuck Todd. I swear MSNBC tries to put together an all star team of reporters who annoy me. If that’s the case as I strongly suspect, than Chucky boy is the Assistant Captain behind his fearless leader Rachel Maddow. Anyway, Chuck’s show used a ticker of upcoming topics much like ESPN shows do and I couldn’t help but notice that Ron Paul was the topic of one of them, titled “Paul’s Position”. This was interesting because in all my mornings of gluttonous TV news I only hear about Congressman Paul about 5% of the time. I waited out Chuck and his panel of experts as they worked their way through the other topics, until it got to the Ron Paul segment. Of course there were first commercials in which Chris Matthews tells us what America is all about and Maddow tells us what’s good and bad for our country. But finally Chuck’s awkward, arrogant face was back on and “Paul’s Position” was up. The substance of the topic was a statement Ron had just made in Des Moines Iowa about Social Security. They showed a 7 second clip of Ron talking to a small crowd about his belief that the Entitlements: Social Security, Medicare and Medicaid, should not be cut in the short term. He stated that in his Presidency he would not try to cut or end these programs because too many Americans have become dependent on the system. He instead would help fund these with the savings from ending the black hole wars we are fighting or invoking until we could sensibly end the safety nets. The reason Dr. Paul made the cut for today’s show finally made sense to me-it was an attempted smear spot. Ole Chuck began framing the subtle argument through his shameful goatee that Ron was starting to become mainstream, in essence he was claiming that the man of principal was pandering! He brought up Ron’s recent TV add that talked about how he fought for Veterans benefits and how this was him embracing his base with sensitive talk to help expand it. I calmed myself down and remembered that poor old Chuck, with his smug smirk, probably hadn’t had enough exposure to Ron Paul. It’s his duty as a member of the media to ignore Ron, so the fact that Ron has stated this position many times throughout the past few years which were NOT Presidential campaign periods may have eluded Chucky. Chuck went to his reporter assigned to the Paul campaign for further comments. I thought, well at least this guy’s been following the campaign and should know that this has been Paul’s view all along. That didn’t happen. The travelling circus act instead fueled the pandering charge fire, further insinuating that Paul is pulling some sort of political strategy with this more sensitive message. So let me be clear to all as innocently ignorant as Chuck or deliberately evil as his travelling side show puppet, Ron Paul has been stating this position since at least 2005. I haven’t tried finding claims that go back before that because although I may work from home, I do actually have a job. He has consistently mentioned the broken system of Social Security and its need for the now dependent elderly and near retired populace. His real stance is a long term gradual phase out, giving young people the freedom to opt out instead of being forced to pay into a failed retirement fund that doesn’t even really exist. I have read and heard this position from him so many times throughout the years and in the 5 minutes I took to get some evidence for this write up, I found this one from 6 years ago (see Social Security Reform Jan 2005). The propaganda machine is starting to wise up as they see his liberty message no longer scaring people away. Before their claims were of his insensitivity and lack of reality, but that message doesn’t carry the same punch that it did for most of his career. Nowadays many people, all sides of the fake aisles, understand and embrace his message. So what do the statists do? Attack the one thing that sets him apart from his colleagues-his unwavering, principled character. Hopefully this won’t work, but I forget that for a lot of people this TV news tabloid crap is all the news they get. I forget that not everyone watches this stuff for decadent entertainment like I do. This is A LOT of people’s sole news source. I take for granted all the alternate news media sources that I only know about after years of recommendations and active searching. 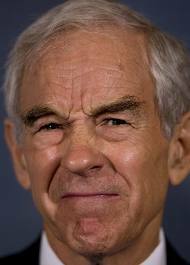 I have actively followed Ron Paul’s career for 4 years now, so have become a little more than a novice in his policies, philosophies, etc. but most people haven’t had that luxury. How could an average person with little media skepticism know that Ron has been stating this entitlement policy for years and that he isn’t just pandering like a garden variety candidate? They couldn’t. It makes me wonder how many lies and biased commentaries I have bought into during this new morning ritual, or throughout my life as an active citizen seeking news. So if you are a mid to upper level expert on something I encourage you to scan the news for misinformation and fight it. We need some honest education on the state of our world, not some overpaid pundit handing down his opinions. Well I can’t speak for all things, but for things Ron Paul, I’ll keep an eye out.